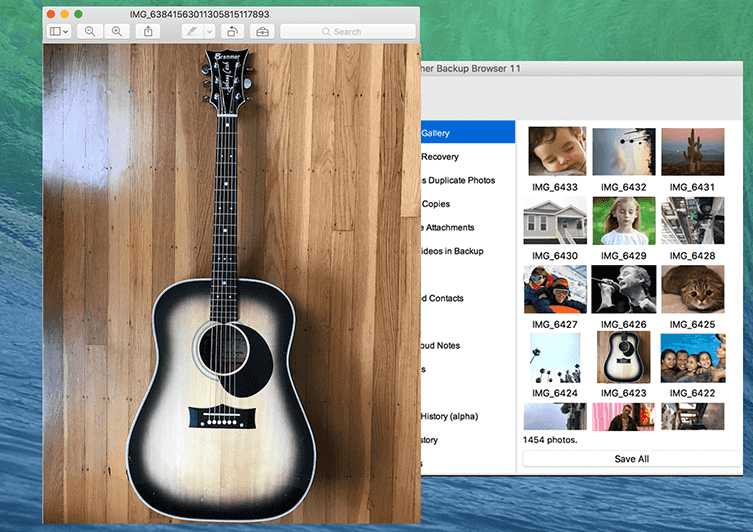 View, search, and recover photos in your iPhone backup. 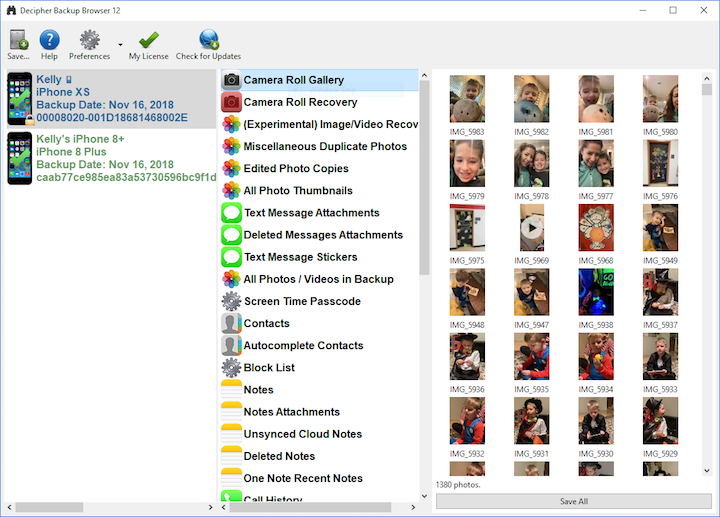 Also recover lost iPhone notes, voice memos, contacts and more. 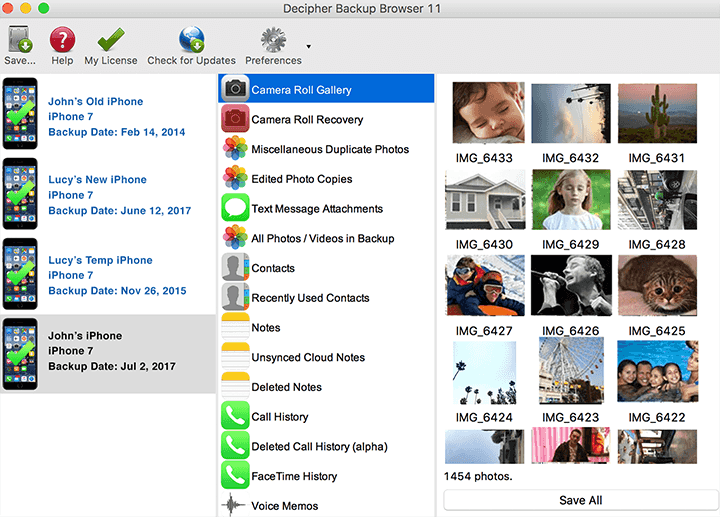 Decipher Backup Browser runs on your computer and NOT directly on your iPhone, iPad, or iPod. Tap the free trial button above to send yourself a download link for Mac and Windows. I AM SO HAPPY YOU HELPED ME RECOVER MY SCREENTIME PASSCODE!!!!! Now I don't have to reset iPhones for my entire family, and my children will not murder me in my sleep. Will tell the world about you. Donation coming on PayPal. SO HAPPY. Thank you. WOW!!! My 17 year old son was devastated! He'd lost everything on his phone including his pictures. After the most amazing help ever from Kelly, everything came back! In this day and age, you always need to be skeptical but please take my word for it, this works and the amount of time that Kelly put into our problem was amazing. Thank you, thank you, thank you! Amazing! After spending hours and hours on trying to recover over a year's worth of pictures for my college aged kid, I finally bit the bullet and purchased the Decipher Browser. I am so glad I did - it saved the day! I am now superdad to my 22 year old daughter and have saved thousands of pictures that she had tried for weeks to recover. Thanks Decipher! Click here to see more comments from our customers! Step 1: Purchase Decipher Backup Browser, or download the free trial to your computer. Step 2: Install the software on your computer. That's right, you need to go to your laptop or desktop machine and install the software there. Step 3: Run Decipher Backup Browser. Select your iPhone backup and what photos, contacts, call history, and other data you would like to see! Please note: you install the software on your computer and not directly on your iPhone. Help! How do I get the Decipher Backup Browser App? You install Decipher Backup Browser directly onto your computer. Click here to remind yourself to install the software later! I just purchased Decipher Backup Browser. How do I install it? As part of your purchase, you were emailed a link to download Decipher Backup Browser. Open that email on your Mac or PC and install the software onto your desktop or laptop computer. You can also download the program onto your computer from our website at any time. Lost your iPhone photos? 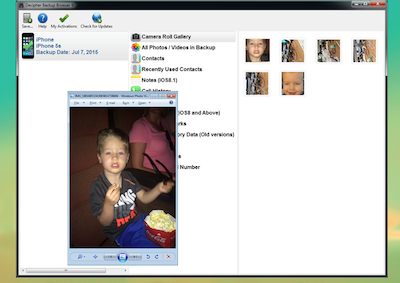 The free trial will show if you if the lost iPhone pictures and videos are in your backup! 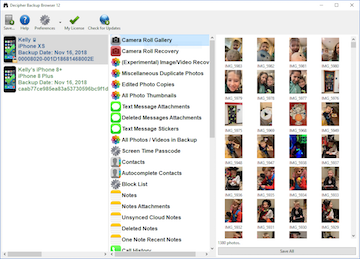 Recover iPhone Camera Roll photos, even from broken backups. View and save Photo Stream pictures. View and save text message/iMessage attachments. View Contacts and import them back into your iPhone Contacts app! Save and recover iPhone Voice Memos. View and save iPhone Notes. Recover forgotten iPhone Restrictions passcode! View outgoing email and text message contacts, phone numbers, and email addresses! Works for email, SMS, and iMessage. Works even if the message and contact are deleted! View and save all your iPhone Call log history! View your iPhone Safari browsing history, recent websites, and bookmarks. Compatible with backups from iOS 4 through iOS 12. 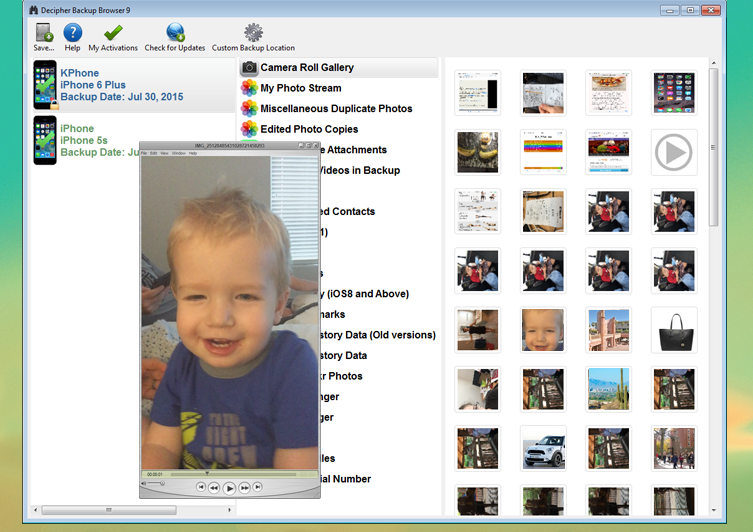 Compatible with all of the latest encrypted backup formats. Supported for Windows XP and above, including Windows 10. Supported for OS X Lion and above, including macOS High Sierra. Software is good for installation on an unlimited amount of computers and for reading an unlimited number of backups. Each purchase comes with two free device activations. Click here to see the Decipher Backup Browser FAQ page. Click here to see the latest Decipher Backup Browser release notes. 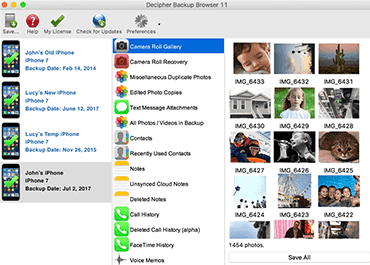 Decipher Backup Browser is software specifically developed to save photos and other files from your iPhone, iPad, or iPod Touch backups to your computer. 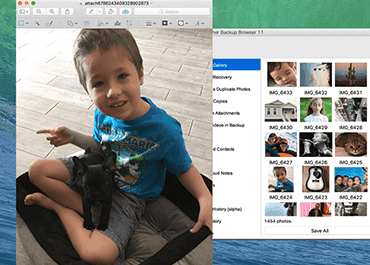 You can recover photos from the camera roll, photo stream, and other apps, as well as address book contacts, voice memo recordings, notes, and many more files from your iOS backup file. Additionally, Decipher Backup Browser runs completely on your computer, so your data remains private. Here at Decipher Media, we understand the importance of your data. We love Decipher Backup Browser not only as product, but also for the many opportunities it has provided us to help people restore or access important information. If you have any problems with Decipher Backup Browser, or just have questions about your iPhone data, please feel free to contact us. Before contacting us via the support email, we ask that you read our FAQ since many helpful answers are available here. As Snap, Inc. makes updates to their app, the data that we can recover in Decipher Backup Browser changes. 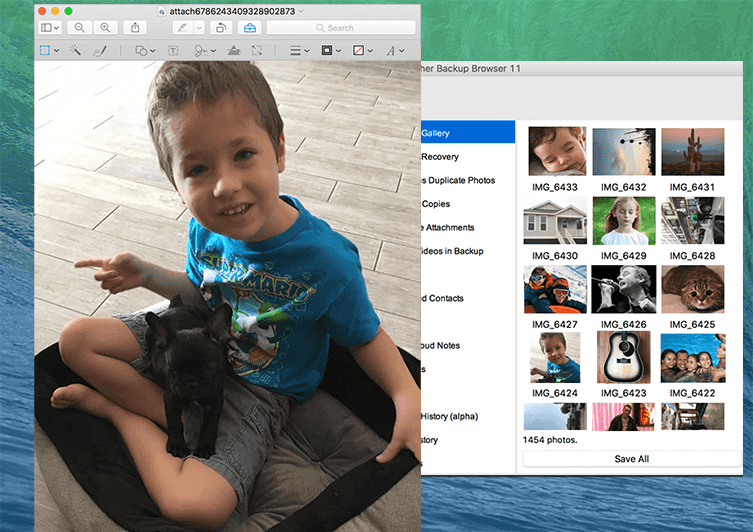 Currently, no sent "snap" photo data is typically available in Decipher Backup Browser because those photos are not saved to be part of the iTunes backup. Decipher Backup Browser can recover Snapchat text message metadata from backups of Snapchat versions before January 2017. The available metadata is information about messages sent and received, not the pictures themselves. As of January 2017 Snapchat versions, Decipher Backup Browser can only recover friends list metadata from Snapchat backed up information. All Snapchat recovery features in Decipher Backup Browser are fully available in the free trial, without a license code, since every recovery scenario is different and the available data is rapidly changing.